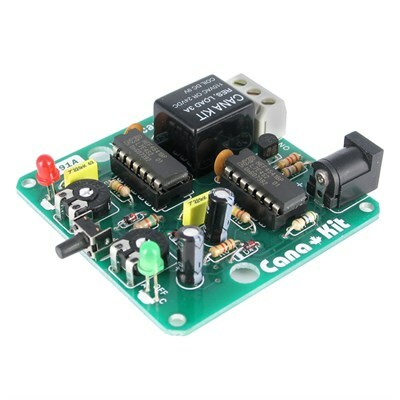 The CK191M1 is a new version of our popular CK191 cyclic timer with unlimited applications. It is adjustable from approximately 0.5 second to 1 minute. The timer incorporates a relay which can handle loads of up to 3A / 110V AC or 24V DC. The timer offers independent On and Off time adjustments through two PCB mounted variable resistors. An optional custom enclosure with silk screened panels is also available separately (Part Number BX-191). 1. On and Off LED Indicators. 2. Professional Screw-on Terminals for relay output as well as an on-board DC jack for easy connection to a DC adapter. 3. Optional Custom Enclosure (Part Number BX-191) with silk screened custom panels. 4. Greatly Improved Accuracy. Our original design was a conventional timer based on the popular 555 timer integrated circuit. All 555 based timers suffer in accuracy due to the fact that the timing period is based on the voltage across an electrolytic capacitor. Our new design is much more accurate as its based on counting the frequency of an oscillator. The design is based around two 4541 Programmable Timer Integrated Circuits which will send a signal to the relay circuit once it reaches a specific count of cycles generated by the oscillator. The oscillators frequency is varied by the variable resistor which results in different timing periods.